TSIBA applies an innovative way to financing education which allows students to contribute towards their tuition at relative levels of affordability. TSIBA degree students study on a scholarship but are required to pay a percentage of their annual tuition fees based on household affordability. Fees are calculated by applying a financial means test based on the combined total household income of each registered student. 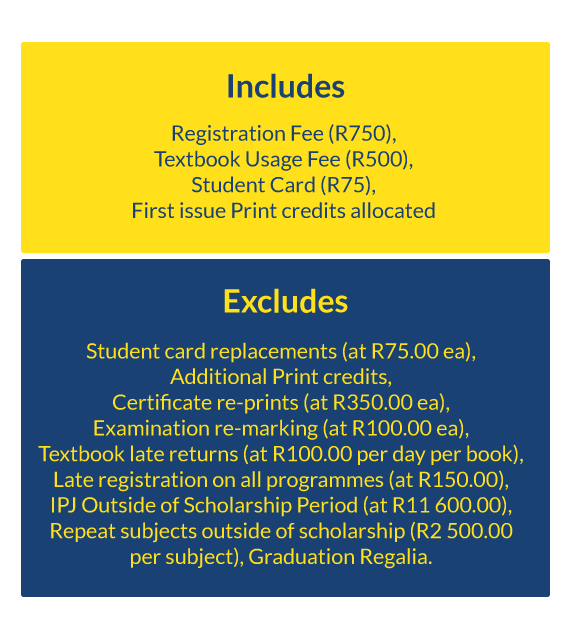 For students on the academic merit list (with high academic performance over two consecutive semesters), the fees are adjusted to the minimum payable amount in the following academic year. Where material changes in household income occur, contributions can also be adjusted. Check the tables below to determine your monthly contributions. What is the scholarship fee schedule? All degree students at TSIBA are required to pay a percentage of annual tuition fees in the form of a monthly fee based on combined household affordability. The scholarship fee is based on a financial means test which is calculated on the combined total household income of registered students. 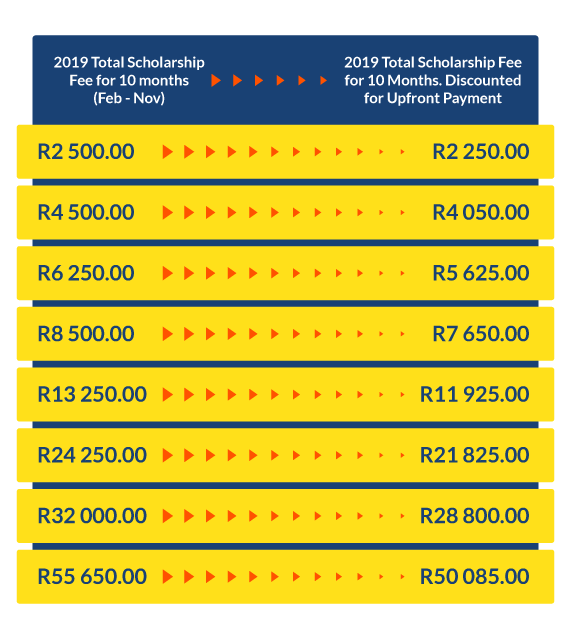 The scholarship fee levels aim to enable students to contribute towards their tuition at relative levels of affordability. For how long do I pay scholarship fees? For as long as a student meets the minimum requirements for a year-on-year academic inclusion. Students outside of academic inclusion will be required to contribute at the full tuition-fee rate. How is my scholarship fee contribution calculated? The scholarship fee is based on a financial means test which is calculated on the combined total household income of registered students. 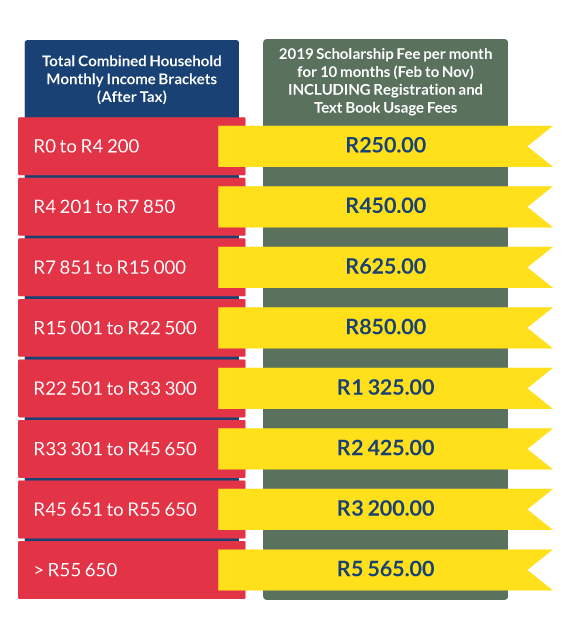 The scholarship fee levels aim to enable students to contribute towards their tuition at relative levels of affordability. What is the minimum monthly scholarship fee contribution? R 250 (Two hundred and fifty rand per month) or discounted to R 225 per month if paid upfront in full by end-March for the 2019 academic year. For what period of my studies is the monthly scholarship fee contribution valid? Your contribution will also be affected when you make the the Academic Merit List for both semesters. Your contribution will be adjusted to the minimum amount payable (R 250) the following academic year. Your monthly contribution will be reviewed and adjusted annually in accordance with market related fluctuations and inflation. When during the year do you pay your scholarship fee contribution? Scholarship Fees are payable monthly (by the 28th of each month) from February to November (10 months) every year. It is also possible to pay annual scholarship fees upfront on registration, in which case the fee is discounted at 10%. PLEASE NOTE: Students should be aware that failure to be paid-up on scholarship fees at the end of Semester 1 will result in non-registration for Semerster 2. Failure to pay scholarship fees at end of Semester 2 will result in exclusion from registration in subsequent academic years and the withholding of academic transcripts. How often can my scholarship fee contribution be re-assessed? The student needs to actively manage their fee contribution by requesting a re-assessment every time his/her personal household circumstances changes. THE ONUS IS ON THE STUDENT TO INFORM TSIBA ABOUT CHANGES TO THEIR HOUSEHOLD CIRCUMSTANCES. The sooner the re-assessment can be completed, the sooner the monthly contribution will be adjusted. Each time you request a re-assessment, you will need to provide TSIBA BUSINESS SCHOOL with updated supporting documentation. What supporting documents do I need to provide with my application? Proof of all household income (copies of payslips and SASSA letters, if unemployed a sworn affidavit declaring no income). Certified copies of ID for TSIBA student, student spouse, student parents, step parents or guardians, all extended family in the household. Certified copies of death certificates of parents, step parents or guardians. What happens to my scholarship fee contribution if I deregister? You will be liable for fees up to and including the month you last attended lectures. Are you looking to crowdfund your scholarship fee schedule? Backabuddy is a platform that offers you the opportunity to take your funding needs into your own hands and use the power of your network to reach your goals. Set yourself up for success, and crowdfund your studies! 2019 scholarship fee per month for 10 months, including registration and text book usage fees. Discounted 2019 scholarship fee for upfront payment, including registration and text book usage fees.